Just exactly what does a person DO with a topical Bible? Are verses in topics intended to be little pills to make a person good? If parents purchase a topical Bible, will their children ever pick it up? Should they require children to read it? Isolated verses aren’t pills to be taken to make a person good, but neither are verses in the complete context where God put them. Change happens through the power of the Holy Spirit as we obey God’s Word, regardless of the number of words we obey. As long as the portion isn’t applied inappropriately, a small phrase can be of great value. 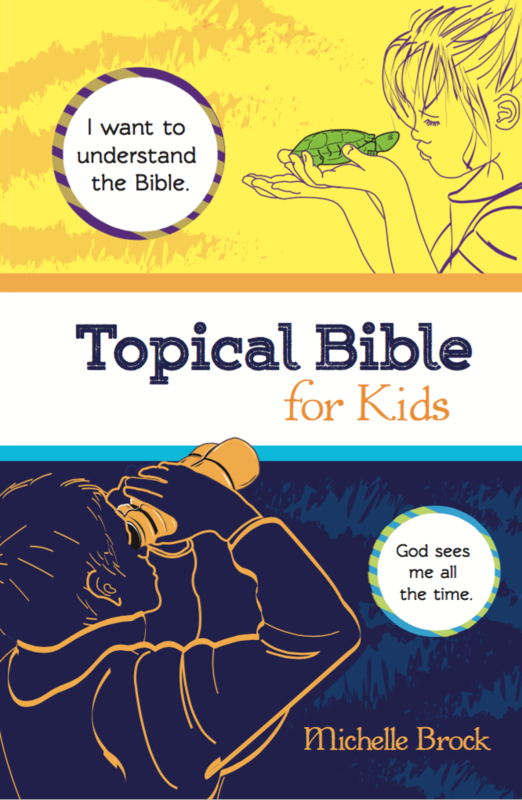 I really intended Topical Bible for Kids to be used by kids, and not simply for kids. I wanted something that they would be able to navigate, even if their reading skills were still developing. I discovered that my own children use it more when they are familiar with it, or if I’ve given them guidance along with it. At the same time, my friends who are using topical Bible have found it a great supplement to their family devotions. Many of them faithfully read sequentially through the Bible with their children, and have found the topical Bible to be a perfect way to add variety to their established routine. Here is an excerpt from the book, with ideas that we have found useful for getting the most out of it. Topical Bible for Kids can be used as a tool for family devotions. Children or parents can pick a topic for discussion, and then read, discuss, or memorize the verses for that topic together. Any of the following recommendations can also be implemented as hands-on family devotion activities. During mealtime discussions or car trips, ask children to identify topics and verses that they like. I like to ask, “What is God teaching you? What are your favorite verses on that topic?” Sometimes I bring up a topic to start the conversation: “What verses comfort you when you are sad?” “Would you like to find some verses together that will be a help to you?” These questions and follow-up study help them see that the Bible is an enjoyable resource for life and delight, and not a club of punishment. Using this book as a starting point, help children write out favorite verses in a handmade book, or on index cards to tape on their wall next to their beds. They may enjoy making and printing “business cards” with topics, verses, and clip art. These also make good gifts. Help young children find and highlight verses they have memorized. These are the easiest verses for new and struggling readers to find in the Bible and read. Read the topics from the table of contents and ask them to stop you when they are interested in finding verses on that topic. Then, encourage them to highlight their favorite verses in their Bibles. Consider allowing children to stay up late, if they are reading or listening to their Bible in their rooms. Teach them that a child doesn’t have to be a good reader to love and obey the Bible! If children are looking for topics not included in this book, show them how to search for new topics online (such as at biblegateway.com), or with a concordance. Help them collect verses on their interests. 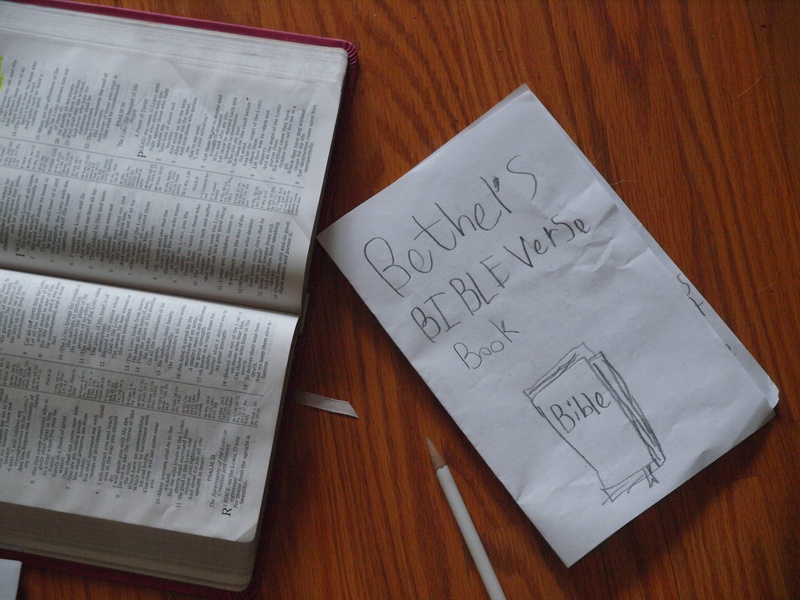 Help children make a chain of verses in their Bibles by writing the next reference on a topic in the margin. Making connections is one way children (and parents) learn to be active and happy students of God’s Word. Help children identify Bible opposites as they study: fighting and forgiveness, complain and contentment, and so on. Many opposites are already given as cross references in the text. Thanks, Mom! Thankful for your example, opinion, and encouragement! Take a trip down to your mom and dad’s house! They have a copy. 🙂 I’ll post a link on November 1. I’ve also been meaning to tell you about another good book I found. It’s called, “Big Truths for Young Hearts,” by Bruce A. Ware, but I’ve been looking for a resource like this. I think the closest thing is Ginger Plowmans Wise Words for Moms chart, but this looks more extensive. Thanks for the suggestion on the Durbin book!